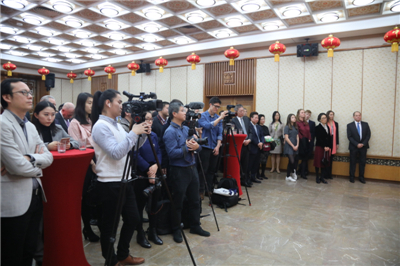 Tonight's reception is very special: On 18 December 2018, a grand gathering was held in Beijing to celebrate the 40th anniversary of China's reform and opening up. At the gathering, President Xi Jinping and other Chinese leaders presented the China Reform and Friendship Medal to ten foreign friends. Among them, Chairman Perry is the only one from the UK. Let's give him and his family a big hand. Congratulations! The 40 years of reform and opening up was a great journey. China embraced the world with open arms and joined hands with global partners to achieve common development. In this historical process, friends from all over the world have participated deeply in China's reform and opening up, and played an active role in promoting the exchanges and cooperation between China and the rest of the world. They have all made outstanding contribution to this great cause. As we celebrate Mr. Perry being awarded the China Reform and Friendship Medal, we need to take a moment to recall the first generation of "Icebreakers" led by Mr. Perry's late father Mr. Jack Perry. In 1950s, Mr. Jack Perry overcame various obstacles and "broke the ice" to trade with New China. Over the years, Mr. Stephen Perry has carried on the "Icebreakers" spirit. He has made active efforts to enhance China-UK cooperation on economy, trade, culture and people-to-people exchanges. He has also initiated the "Young Icebreakers" and the "Women Icebreakers". He has witnessed, supported and contributed to China's reform and opening up. He has been an old friend and good friend of the Chinese people. He well deserves the China Reform and Friendship Medal. It represents the sincere thanks of the Chinese people to three generations of the Perry family for their support for China's reform and opening up. It embodies our expectation that the people from all walks of life in Britain will take part in China's new round of reform and opening up. Over the past 40 years, China-UK relations have gone through twists and turns. The Chinese and British people have made relentless efforts and come a long way to build the "Golden Era". This has not been easy and it deserves our greatest care and attention. As we celebrate Mr. Perry's award, we also need to take a moment to renew our commitment to China-UK relations. We need to think about how to build on our past achievements and forge ahead to make steady and sustained progress in the "Golden Era". I believe from Mr. Perry's award we can learn three important things. In the early years of the People's Republic, Western countries imposed economic blockade on China. Jack Perry "broke the ice" and spearheaded China-UK cooperation. His brave action lived up to the spirit of equality, openness and inclusiveness. However, the Cold War mentalities die hard. Some in the world still regard China's development as a challenge or even threat. Yet, such views go against the trend of the times. The ideological mind-set, prejudice and misunderstanding are the "new ice" that we must break. 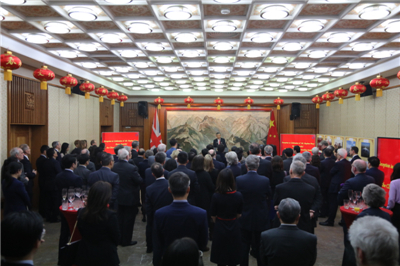 We must carry on the "Icebreakers" spirit to promote deeper trust and closer cooperation between China and the UK. From 1978 to 2018, our bilateral trade increased by nearly 80 times, from less than $1 billion to about $80 billion a year. Two-way investment was zero 40 years ago. Today, UK's direct investment in China exceeds $26 billion, and China has invested more than $21 billion in the UK. This is exactly what Mr. Perry and other pioneers of China-UK exchanges have been working on. They have actively engaged in China's reform and opening up. They have promoted China-UK cultural and people-to-people exchanges. Their efforts have resulted in better mutual understanding and stronger friendship between our two countries. 2019 is an important year for both China and the UK: China will celebrate the 70th anniversary of the founding of the People's Republic, and the UK will enter a post-Brexit era. I hope that the "Icebreakers" spirit will continue to inspire people across all sectors from both China and the UK to stay at the forefront of the times and to break new grounds. Together we can create an ever-brighter future for China-UK relations!